When you pass 186MPH the speedo displays --- instead of numbers. A while back with my GPS it said 192 with a little head wind with the 39T. Last edited by ScrapperX; Mar 23rd 2013 at 06:04 PM. I'm a bit surprised you felt that it wasn't pulling as hard at the top end, surely with a 41T it should be pulling harder than the 39T or is it past peak HP at that point? Would be amazing to see a dyno chart for 41T conversion compared to stock. Last edited by WAfatboy; Mar 23rd 2013 at 06:05 PM. Ok, I went out and finally installed the AFAM 520 conversion kit today (light weight). 15T steel front sprocket, 41T Rear (Aluminum), Carrier (Aluminum) and DID ERV3 chain. It really made the bike easier to ride in the streets. Midrange power is really noticeable. I will say quite a bit more power in the midrange. Quicker acceleration and was able to achieve "---" on the speedo with no problem. Didn't have my GPS so I don't know how fast I was going once I reached --- on the speedo and it didn't feel like it was pulling as hard like the 39T did but still pulled some. Power wheelies, a lot easier. Best part for me is it reduced the tall gearing. I can now ride at slow speeds 35 MPH or less with enough power without sounding like I don't know how to shift. All in all I recommend the change. There is a huge weight savings. +1, what I've (and others) have been saying all along for the 14/39. Generally when you go up on the rear sprocket you lose top end and gain in acceleration in low and midrange. 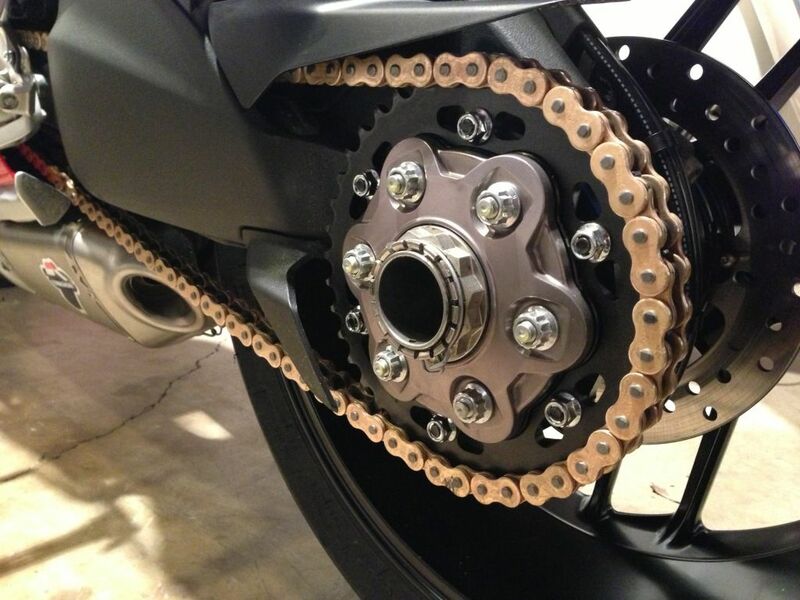 If you go larger in the front sprocket you gain top end and loose acceleration in the low and mid. That's why the R went to a 15/41 to gain mid range and the extra 500 RPM from Ti conrods and lighter flywheel so they wouldn't loose top end speed. Last edited by ScrapperX; Mar 23rd 2013 at 06:28 PM. How much top end speed do you think you'd lose? Just had the new 15/40 525 drivetrain installed and i'm really happy with the one tooth jump in the rear. While the difference is definitely noticeable (much smoother down low) it doesn't seem to come at any expense at the throttle (not snatchy). I'm not sure that I'd want to jump up yet another tooth; this configuration seems to offer a good balance, maybe the sweet spot amongst the two. Then again, maybe the 15/42 is even better but I'm pretty happy as it is now. Today's ride will tell me more. Generally when you go up on the rear sprocket you lose top end and gain in acceleration in low and mid range. If you go larger in the front sprocket you gain top end and loose acceleration in the low and mid. That's why the R went to a 15/41 to gain mid range and the extra 500 RPM from Ti conrods and lighter flywheel so they wouldn't loose top end speed. Last edited by CEROVA1199; Mar 24th 2013 at 01:44 PM. I also noticed a significant increase in MPG. Forgot to mention it. Rode about 90 miles up in the canyons today.....I'm beyond content with the performance of the drivetrain mod. The new ECU and gearing really help it at slow speeds and at cruising speeds and truly shines in and out of turns. Perfectly suited for the roads I ride. 32mpg avg with it and the Termi slips (baffles out).